The tale of Beren and Lúthien, told in several works by J. R. R. Tolkien, is the story of the love and adventures of the mortal Man Beren and the immortal Elf-maiden Lúthien. (Early versions of the story, published in the standalone book in 2017, described Beren as a Noldorin elf.) Tolkien wrote several versions of their story, the latest in The Silmarillion, and the tale is also mentioned in The Lord of the Rings. The story takes place during the First Age of Middle-earth, about 6,500 years before the events of The Lord of the Rings. Beren, son of Barahir, cut a Silmaril from Morgoth's crown as the bride price for Lúthien, daughter of the elf-king Thingol and Melian the Maia. He was slain by Carcharoth, the wolf of Angband, but alone of mortal Men returned from the dead. He lived then with Lúthien on Tol Galen in Ossiriand, and fought the Dwarves at Sarn Athard. He was the great-grandfather of Elrond and Elros, and thus the ancestor of the Númenórean kings. After the fulfilment of the quest of the Silmaril and Beren's death, Lúthien chose to become mortal and to share Beren's fate. The first version of the story is the Tale of Tinúviel, which was written in 1917 and published in The Book of Lost Tales. During the 1920s Tolkien started to reshape the tale and to transform it into an epic poem which he called The Lay of Leithian. He never finished it, leaving three of seventeen planned cantos unwritten. After his death The Lay of Leithian was published in The Lays of Beleriand, together with The Lay of the Children of Húrin and several other unfinished poems. The latest version of the tale is told in prose form in one chapter of The Silmarillion and is recounted by Aragorn in The Fellowship of the Ring. The Tale of Aragorn and Arwen, which is told in the appendices of The Lord of the Rings, served as a sequel to this story. Indeed, both Aragorn and Arwen were descendants of Beren and Lúthien. Beren left Doriath and set out on his quest to Angband, the enemy's fortress. Although Thingol tried to prevent it, Lúthien later followed him. On his journey to the enemy's land Beren reached Nargothrond, an Elvish stronghold, and was joined by ten warriors under the lead of King Finrod, who had sworn an oath of friendship to Beren's father. Although Fëanor's sons, Celegorm and Curufin, warned them not to take the Silmaril that they considered their own, the company was determined to accompany Beren. On their way to Angband they were seized by the servants of Sauron, despite the best efforts of Finrod to maintain their guise as Orcs, and imprisoned in Tol-in-Gaurhoth. One by one they were killed by a werewolf until only Beren and Finrod remained. When the wolf went for Beren, Finrod broke his chains and wrestled it with such fierceness that they both died. When she was following Beren, Lúthien was captured and brought to Nargothrond by Celegorm and Curufin. Aided by Huan, Celegorm's hound (which according to prophecy could only be defeated by the greatest werewolf ever), she was able to flee. With his aid she came to Sauron's fortress where Huan defeated the werewolves of the Enemy, Draugluin the sire of werewolves, and Sauron himself in wolf-form. Then Lúthien forced Sauron to give ownership of the tower to her. She freed the prisoners, among them Beren. Meanwhile, Sauron took the form of a vampire and fled to Taur-nu-Fuin (the former Dorthonion). Beren wanted to try his task once more alone, but Lúthien insisted on coming with him. However they were attacked by Celegorm and Curufin, who had been exiled from Nargothrond. Beren was wounded by Curufin, but Lúthien healed him. Through magic they took the shapes of the bat Thuringwethil and the wolf Draugluin that Huan had killed. Thereby they were able to enter the enemy's land and at last came to Angband and before Morgoth's throne. There Lúthien sang a magical song which made the Dark Lord and his court fall asleep; then Beren cut a Silmaril from Morgoth's crown. As he tried to cut out the others, his knife broke and a shard glanced off Morgoth's face, awakening him. As they attempted to leave, the gate was barred by Carcharoth, a giant werewolf, who was bred as an opponent to Huan. He bit off and swallowed Beren's hand, in which Beren was holding the Silmaril. [note 2] Carcharoth was burned by the pure light of the Silmaril and ran off madly. Eagles then helped Beren and Lúthien escape. Beren and Lúthien returned to Doriath, where they told of their deeds and thereby softened Thingol's heart. He accepted the marriage of his daughter and the mortal Man, although Beren's task had not been fulfilled. Beren and Huan participated in the hunt for Carcharoth, who in his madness had come into Doriath and caused much destruction there. Both of them were killed by the wolf, but Carcharoth was also slain. Before he died, Beren handed the Silmaril, which was recovered from Carcharoth's belly, to Thingol. Grieving for Beren, Lúthien also died, and came to the halls of Mandos. There she sang of her ill fate, that she would never again see Beren, who as a mortal Man had passed out of the world. Thereby Mandos was moved to pity. He restored Beren and Lúthien to life and granted mortality to the Elf. Lúthien left her home and her parents and went to Ossiriand with Beren. There they dwelt for the rest of their lives, and both eventually died the death of mortal Men. After the recovery of the Silmaril by Beren and Lúthien, many people of Middle-earth sought to possess it, and there were wars between the Sindar, the Noldor and the Dwarves, in which the Sindar were defeated. The Silmaril was taken by Eärendil, who sailed to Valinor with it and persuaded the Valar to make war on Morgoth, which led to the latter's defeat in the War of Wrath. The marriage of Beren and Lúthien was the first of the three unions of a mortal Man and an Elf, of which came the Half-elven, those who had both elven and human ancestry. Like Lúthien, they were given the choice of being counted among either Elves or Men. The extended edition of the live-action film The Fellowship of the Ring would make this connection through a song Aragorn sings at night in Elvish. When questioned by Frodo, he simply explains that it relates to an Elven woman who gave up her immortality for the love of a Man. The tale of Beren and Lúthien was regarded as the central part of his legendarium by Tolkien. The story and the characters reflect the love of Tolkien and his wife Edith. Particularly, the event when Edith danced for him in a glade with flowering hemlocks seems to have inspired his vision of the meeting of Beren and Lúthien. Also some sources indicate that Edith's family disapproved of Tolkien originally, because he was a Catholic. On Tolkien's grave, J. R. R. Tolkien is referred to as Beren and Edith is referred to as Lúthien. The tale of Beren and Lúthien also shares an element with folktales such as the Welsh Culhwch and Olwen, maybe its main literary inspiration, and the German The Devil With the Three Golden Hairs and The Griffin—namely, the disapproving parent who sets a seemingly impossible task (or tasks) for the suitor, which is then fulfilled. The hunting of Carcharoth the Wolf may be inspired by the hunting of the giant boar Twrch Trwyth in Culhwch and Olwen or other hunting legends. The quest for one of the three Silmarils from the Iron Crown of Morgoth has a close parallel in the search for the three golden hairs in the head of the Devil. The sequence in which Beren loses his hand to the Wolf may be inspired by the god Tyr and the wolf Fenrir, characters in Norse mythology. Tolkien also got inspiration from the great love story of Romeo and Juliet. The story was published as a standalone book edited by Christopher Tolkien under the title Beren and Lúthien on 1 June 2017, being pushed back from its original publication date of 4 May 2017. The story is one of three contained within The Silmarillion that Tolkien believed warrant their own long-form narratives, the other two being The Children of Húrin and The Fall of Gondolin. The book is illustrated by Alan Lee and edited by Christopher Tolkien, and it features different versions of the story, showing the development of the tale over time. It is painstakingly restored from Tolkien's manuscripts and presented for the first time as a continuous and standalone story. The intent of the book is to extract a single narrative out of the ever-evolving materials that make up "The Tale of Beren and Lúthien". It does not contain every version or edit to the story, but those Christopher Tolkien believed would offer the most clarity and minimal explanation. ...I have tried to separate the story of Beren and Tinúviel (Lúthien) so that it stands alone, so far as that can be done (in my opinion) without distortion. On the other hand, I have wished to show how this fundamental story evolved over the years. The purpose of this book, then, is altogether different from that of the volumes of The History of Middle-earth from which it is derived. It is emphatically not intended as an adjunct to those books. 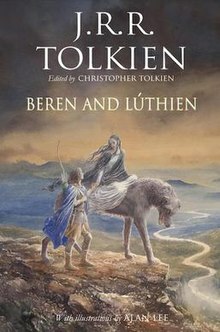 It is an attempt to extract one narrative element from a vast work of extraordinary richness and complexity; but that narrative, the story of Beren and Lúthien, was itself continually evolving, and developing new associations as it became more embedded in the wider history. The decision of what to include and what to exclude of that ancient world 'at large' could only be a matter of personal and often questionable judgement: in such an attempt there can be no attainable 'correct way'. In general, however, I have erred on the side of clarity, and resisted the urge to explain, for fear of undermining the primary purpose and method of the book. A further problem which I should mention arose from the very frequent changes of names. To follow with exactness and consistency the succession of names in texts of different dates would not serve the purpose of this book. I have therefore observed no rule in this respect, but distinguished old and new in some cases but not in others, for various reasons. In a great many cases my father would alter a name in a manuscript at some later, or even much later, time, but not consistently: for example, Elfin to Elven. In such cases I have made Elven the sole form, or Beleriand for earlier Broseliand; but in others I have retained both, as in Tinwelint/ Thingol, Artanor/ Doriath. Further chapters continue the story in through later poems, summaries, and prose, showing how the story evolved over time, in order of the chronology of the story itself (not necessarily the order in which the texts were written or published). These include portions of various versions of "The Lay of Lethian", The Silmarillion, and later chapters of Lost Tales. Since J. R. R Tolkien made many changes in this story, affecting both narrative and style, the presentation in the book is not entirely consistent. There is some overlap of details (and discrepancy in continuity), but the sections attempt a complete and continuous story. Christopher Tolkien included further editorial explanations and historical details to bridge between sections. Details lost in later accounts were reintroduced: such as Tevildo (who due to the nature of his introduction is treated as a separate character, rather than an early conception of Sauron), Thû the Necromancer (treated as the first appearance of Sauron), the Wicked (or "treacherous") Dwarves (one of The Hobbit's references to Lost Tales), and other terminology such as Gnome, Fay, Fairy, leprechaun, and pixie. Some of these terms appear in early editions of The Hobbit, but were dropped in later writing. The book offers an "in-universe" perspective for the inconsistencies, as owing to the evolution of the stories told by different perspectives and voices over time, rather than simply reflecting Tolkien's changing ideas over time. the First Age in The History of Middle-earth was in those books conceived as a history in two senses. It was indeed a history— a chronicle of lives and events in Middle-earth; but it was also a history of the changing literary conceptions in the passing years; and therefore the story of Beren and Lúthien is spread over many years and several books. Moreover, since that story became entangled with the slowly evolving Silmarillion, and ultimately an essential part of it, its developments are recorded in successive manuscripts primarily concerned with the whole history of the Elder Days. This book reintroduces details that were omitted in the highly edited version of The Silmarillion's "Of the Ruin of Doriath"; it includes the cursed treasure of Mîm, and the fact that Doriath was betrayed from the inside, and that Thingol was able to push the dwarves out of the city, and that he was later killed by an ambush of dwarves. It roughly reconciles the elements of early Lost Tales with details constructed by Guy Kay for the chapter in the Silmarillion, to bring it closer to J.R.R. Tolkien's intention (see The War of the Jewels). ...there are brought to light passages of close description or dramatic immediacy that are lost in the summary, condensed manner characteristic of so much Silmarillion narrative writing; there are even to be discovered elements in the story that were later altogether lost. Thus, for example, the cross-examination of Beren and Felagund and their companions, disguised as Orcs, by Thû the Necromancer (the first appearance of Sauron), or the entry into the story of the appalling Tevildo, Prince of Cats, who clearly deserves to be remembered, short as was his literary life. ^ a b "JRR Tolkien book Beren and Lúthien published after 100 years". Oxford: BBC News. 1 June 2017. ^ J. R. R. Tolkien (Christopher Tolkien, ed. ), The Silmarillion, Harper Collins, London, 1999. ^ Silmarillion sources, by "mithrandircq"
^ Tom Shippey, The Road to Middle-earth, pp. 193–194: "The hunting of the great wolf recalls the chase of the boar Twrch Trwyth in the Welsh Mabinogion, while the motif of 'the hand in the wolf's mouth' is one of the most famous parts of the Prose Edda, told of Fenris Wolf and the god Tyr; Huan recalls several faithful hounds of legend, Garm, Gelert, Cafall." ^ Dickerson, Matthew; O'Hara, David (2006). From Homer to Harry Potter. Brazos Press. pp. 141–2. ISBN 978-1-44120-214-7. ^ Helen, Daniel (17 February 2017). "Beren and Lúthien publication delayed". Retrieved 24 February 2017. ^ Beren and Lúthien Hardcover – 4 May 2017. ASIN 0008214190. ^ Flood, Alison (19 October 2016). "JRR Tolkien's Middle-earth love story to be published next year". Retrieved 17 October 2016. ^ "Beren and Lúthien on the Official Tolkien Online Book Shop". Retrieved 27 December 2016. ^ Tolkien, J.R.R.. Beren and Lúthien (Kindle Locations 86-88). Houghton Mifflin Harcourt. Kindle Edition. ^ Tolkien, J.R.R.. Beren and Lúthien (Kindle Locations 129-135). Houghton Mifflin Harcourt. Kindle Edition. ^ Tolkien, J.R.R.. Beren and Lúthien (Kindle Locations 124-129). Houghton Mifflin Harcourt. Kindle Edition. ^ Tolkien, J.R.R.. Beren and Lúthien (Kindle Locations 74-79). Houghton Mifflin Harcourt. Kindle Edition. ^ Tolkien, J.R.R.. Beren and Lúthien (Kindle Locations 95-99). Houghton Mifflin Harcourt. Kindle Edition.